The first-ever Interschool Championship was a great success. It has been our third year promoting the sport and all the hard work has come into play. Back in the days when we first started the Association, there were only around twenty beginners. We could only get better in skills through self-practice and participating in overseas tournaments. 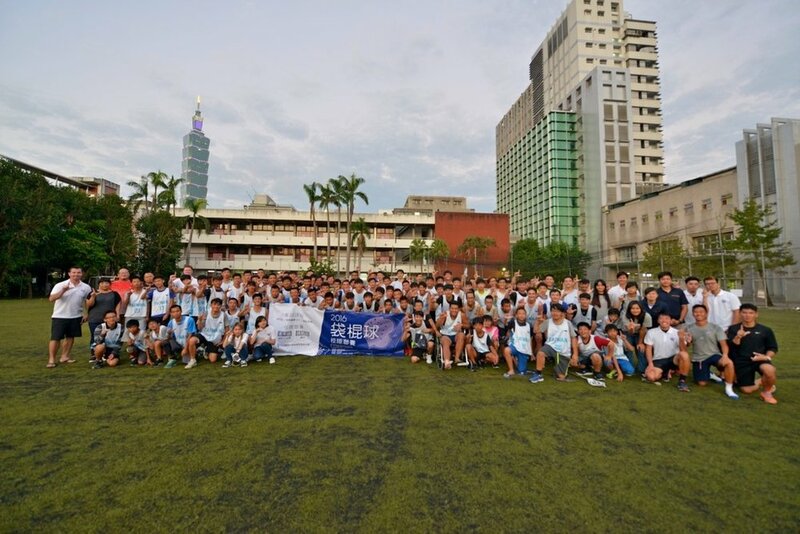 As time went by, the sport of lacrosse has become more popular among schools, and more teams have been established across Taiwan, which sparked off the happening of the interschool championship. Eventually, making this an arena for our home grown players to showcase their skills. The interschool tournament was more than a couple of scrimmages. With the fact that there are quite a lot of beginners who have learnt the sport for merely three months, the tournament was separated into two divisions. In addition, there were all sorts of skill clinics like shooting and goaltending, rules overview and stringing theory held throughout the event. In spite of the packed schedule, players showed their enthusiasm in learning. Travis Gillespie, the head coach of Taiwan Team, came all the way from Canada to participate in this momentous event..
“I was once a professional lacrosse player; it has been so many years that I hardy get excited about lacrosse - until I came to Taiwan - the progress here surprises me every single time. Taitung Dong Hai Junior High school. The tournament adopted the format of 7-on-7 instead of the regular 10-on-10 full field game, which led to faster tempo in both offence and defense. There are a total of 4 teams (High school/College) in the Advanced Division, taking on each other in a double-robin system before playing the championship game. While in the Beginners Division(Junior High), two united teams would play against each other to determine the winner. Among the four teams in the Advanced Division, Taipei City University has the most all-rounded roster, with several experienced national team players in the team. But they have never thought of giving in less effort. “I always ask my teammate to play their best game regardless of what opponent they are facing.” Taipei City University of Science and Technology’s goalie Tsao Yo-Chi said. “ We are just comparatively more experienced. Both our opponents and us would get better by playing wholeheartedly. ” After all, the overall improvement in Taiwan lacrosse is what matters the most. Kung-Tung Technical Senior High School was the first to have a lacrosse team in Taiwan. (some of the players have graduated from high school and entered university). Lacrosse has started to become a tradition of the school, and more and more athletes are joining the team. "Hard work is our strength, that’s why we hustle hard for every ground ball." Changhua County Tianjhong Senior High School has the freshest team. All their players have started playing the sport for 3 months only. Because of that, every match is a valuable lesson to them. to lead their own school teams to join the tournament next year! The overall champion of Advanced Division went to Taipei City University of Science and Technology, whereas the Tian-Pei United Team won the Beginners Division. Lacrosse matches are never about winning or losing. The most valuable thing for players are what they were able to learn from in and out of the field. Hu Jian-Ying, 2nd year student from Kung-Tung , mentioned that the two things he deemed the most important in a lacrosse match are communication and attitude. “Good communication would come through building up the habit of talking on the field, but you have to build up your own attitude first. Do not bother to go on field if you do not treat every game or practice seriously. The game is all about fighting until the end, be it winning or losing . You would only lose even more if you do not fight till the end. You can always learn more from being defeated. We are delighted to know that each lacrosse player was inspired in different ways . Apart from hoping to see improved skills on the field, we hope everyone can uphold the "Taiwan Magpie spirit"* of the Association – to spread the game of lacrosse. Let's hope that everyone will continue to learn, take care, and at the same time compete with each other in this one big family. We would like to take this opportunity to show our gratitude to our helpers, teachers, coaches and players who participated. It was a wonderful weekend of lacrosse. We cannot wait for the second year to come. *General species of magpie babies leave their nests when they grow to become an adult bird and capable of taking care of themselves. Only the Taiwan magpies would stay in their nests to take care of other younger sibling birds before leaving. We hope our lacrosse players would continue to pass on this tradition of succession.